Unique Gifts, Beauty Supplies, Over the Counter Meds at Burts Pharmacy and Fine Gift Boutique! Get $30 Worth of Merchandise for Just $15! Stock up on Great Gifts For the Holidays! Click on Main Image for a Sneak Peek Inside! Great place to get all of your holiday gifts! Adorable boutique with high-end gifts! Burt’s Pharmacy is unlike any pharmacy you have visited in your life! 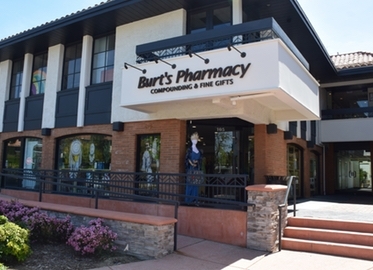 This is an intimate, personal pharmacy that has high-end over the counter brands, an incredible selection of health, wellness, and beauty supplies, and a gift section that rivals any high-end gift store in the Conejo Valley! (For a sneak peek inside, click on the main image for a short video!) Join me in stocking up on gifts for friends and family for the holidays! And with today’s deal, we “compound” the savings: get $30 worth of items in their retail shop for just $15. Our prescription is for up to five certificates per member; take one certificate per day with or without food! P.S. And if you are looking for a pharmacy where they take a personal interest in you and provide exceptional service, this is it!